Whole Brain Thinking is a theory that’s been around since the 1970’s. It focuses on the thinking preferences of different people and it aims to enlighten training professionals and learners on the nuances of the brain when learning. Tremendously popular, it’s one of the most common approaches to learning. It can help you identify the best practices for training and make your eLearning much more impactful and engaging. It’s simple to understand too. Even training beginners can get insights and implement some of the practices of this theory. 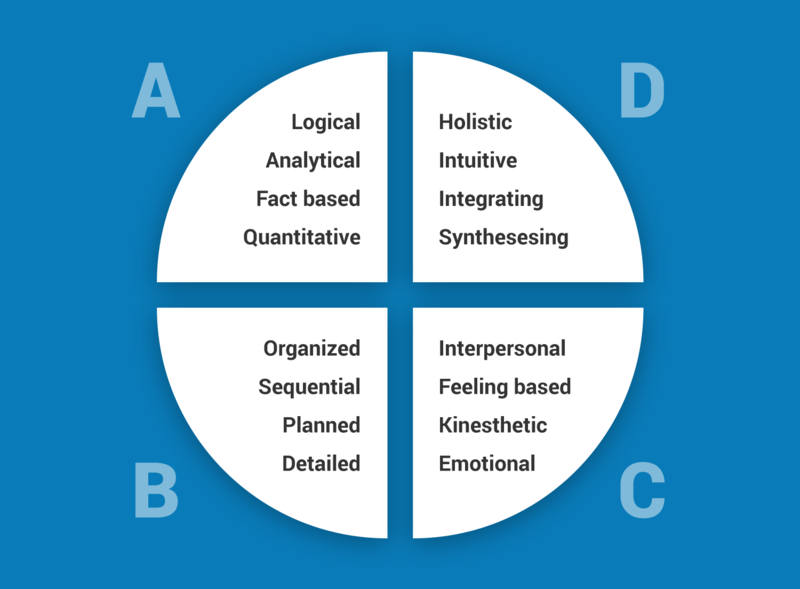 Developed by Ned Herrmann, Whole Brain Thinking divides the brain into four quadrants. Each quadrant represents a different part of the brain: Analytical, Practical, Relational, Experimental. While everybody has these quadrants, it advocates that we all have a preferred way of thinking without even realizing it. Some of us like to think outside the box, be creative. While others just want the straight up facts. It explains why some learners accelerate in certain areas and may struggle in others. Whole Brain Thinking advises trainers to develop learning methods that exercise all areas of the brain where possible. This ensures that your learners are using the ‘stronger’ side of their brain, while also challenging and exercising the less dominant sides. In turn, it makes your training more engaging, caters to all learners and increases their chance of success. As an organization delivering training, it’s unlikely you’ll know which learning style suits your learners - especially if it’s external learners like customers or partners. It’s also extremely unlikely your learners fit into one, single quadrant. So, how do you create training that has the most impact on your learners? The answer - engage every part of your learner’s brain. Through clever use of eLearning techniques, you can incorporate different elements into your courses that engage each quadrant. It also allows your learners to develop their ‘weaker’ quadrants. To create a universally engaging learning experience, first, let’s explore the learning techniques favored by each quadrant. Logical: Facts and figures fans, this group likes to know about proof-points. They respond well to learning goals and objectives and like to learn in a clear, concise way. That means minimal text, lots of charts, data, research-backed information and a direct learning goal. Organized: The rule followers, this quadrant likes order and procedure. Just like quadrant A, they respond well to goal-oriented learning that’s concise and planned out. They prefer to be prepared, follow instructions and learn via quizzes, step by step exercises, checklists and with practical feedback. Emotional: These are ‘people persons’. They are empathic, emotionally in tune, and enjoy learning with other people. They’re cooperative and work well in teams where thoughts, ideas, and discussion can be heard. Seeing the information in action through stories and experiences is what they’re drawn too. Holistic: Finally, the true creatives. This group is more about the abstract. They, too, like minimal details, however, they also like to explore ideas and muse on what they’re being informed on. Idea generation and thought exercises are key to them learning best. And visuals, lots and lots of visuals, that illustrate key information, and make the learning more engaging. Chances are most of your training relies heavily on the same learning elements. Your primary training might be text-based, data-heavy courses with a quiz or regular webinars or only face-to-face learning. It’s a great idea to dig into the strategies you rely on most. That way you’ll know which quadrant or quadrants you’re catering to and which are being forgotten. Next, plan and create content that covers more than one quadrant to ensure maximum engagement. For example, if your training is all data based, that’s an attractive way to learn for quadrant A. We can make this more engaging to quadrant D, a visually motivated learner, by creating graphics with the data that are interactive and attractive. 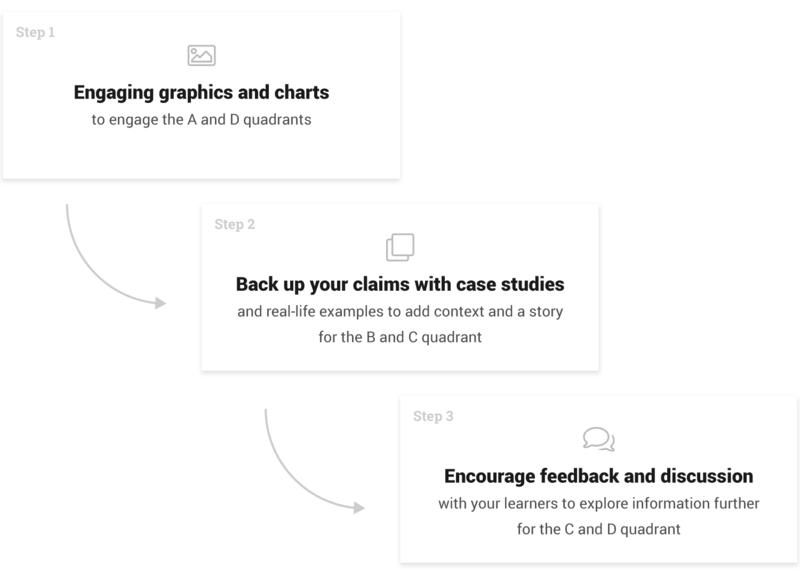 For B and C, we can find studies and real-life examples to back up the data that bring the story to life, add context and humanize the information you’re providing. You can also encourage feedback and discussion in person or through your LMS between instructors and learners or between learners themselves so that C and D quadrant learners can explore the ideas further. The trick with Whole Brain Thinking is to experiment with the training you’re delivering. Constantly reinventing your training techniques, seeing how your learners react and building from there is the key to nurturing your learners and boosting your engagement. Don’t worry if not all of your learning and course content is moldable for each quadrant. Sometimes learning has to be delivered in a set way. Not all of your courses need to be made for each quadrant. It’s all about finding a sweet spot that helps engage the most learners when appropriate. For businesses to get better learning results, Whole Brain Thinking is a smart method to enforce. Whether you decide to make all of your current learning whole brain, or even just reassess some of the methods you use to train to cater to wider learning techniques, it’s a worthwhile practice to invest in.